Is There An Association Between Fluoride In Water and Cancer? Can fluoridated water cause cancer ? What is fluoride, and where is it found ? What is water fluoridation ? When did water fluoridation begin in the United States ? helping keep body temperature normal. Fluorides are present naturally in water and soil at varying levels 2). Fluoride is the name given to a group of compounds that are composed of the naturally occurring element fluorine and one or more other elements. In the 1940s, scientists discovered that people who lived where drinking water supplies had naturally occurring fluoride levels of approximately 1 part fluoride per million parts water or greater (>1.0 ppm) had fewer dental caries (cavities) than people who lived where fluoride levels in drinking water were lower. Many more recent studies have supported this finding 3). It was subsequently found that fluoride can prevent and even reverse tooth decay by inhibiting bacteria that produce acid in the mouth and by enhancing re-mineralization, the process through which tooth enamel is “rebuilt after it begins to decay 4), 5). In addition to building up in teeth, ingested fluoride accumulates in bones. Water fluoridation is the process of adding fluoride to the water supply so the level reaches approximately 0.7 ppm (0.7 part fluoride per million parts water) or 0.7 milligrams of fluoride per liter of water; this is the optimal level for preventing tooth decay 6). 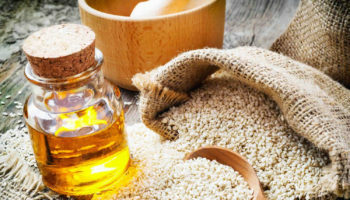 This finding, considering the thousands of participants in the study, amounted to a giant scientific breakthrough that promised to revolutionize dental care, making tooth decay for the first time in history a preventable disease for most people. 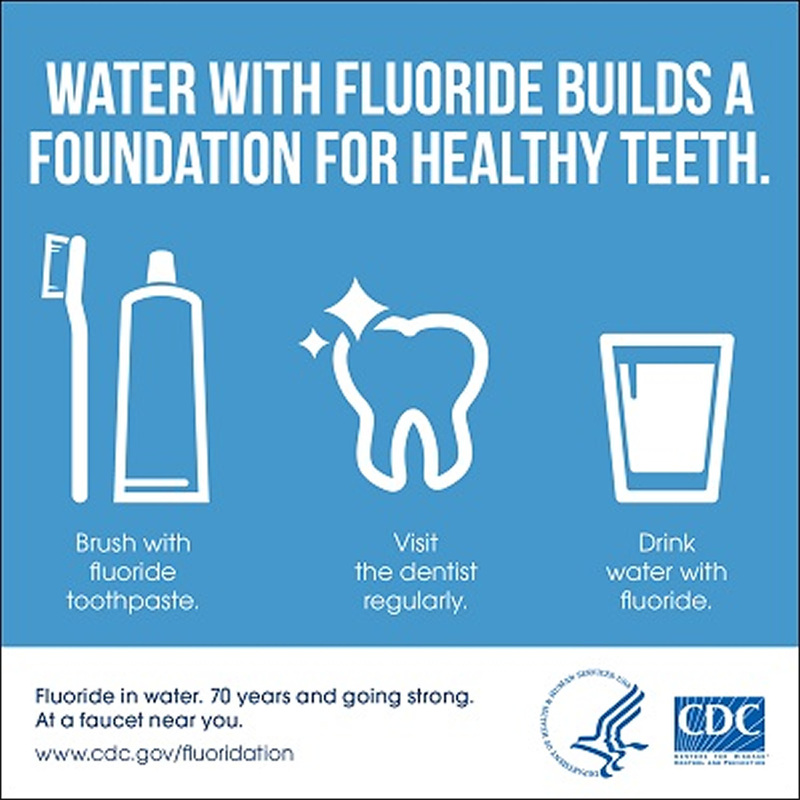 The Centers for Disease Control and Prevention (CDC) considers fluoridation of water one of the greatest achievements in public health in the 20th century. In 1945, Grand Rapids, Michigan, adjusted the fluoride content of its water supply to 1.0 ppm and thus became the first city to implement community water fluoridation. By 2008, more than 72 percent of the U.S. population served by public water systems had access to fluoridated water 7). Dental fluorosis is a condition that causes changes in the appearance of tooth enamel. It may result when children regularly consume fluoride during the teeth-forming years, age 8 and younger. Most dental fluorosis in the U.S. is very mild to mild, appearing as white spots on the tooth surface that may be barely noticeable and do not affect dental function. Moderate and severe forms of dental fluorosis, which are far less common, cause more extensive enamel changes. In the rare, severe form, pits may form in the teeth. The severe form hardly ever occurs in communities where the level of fluoride in water is less than 2 milligrams per liter 8). Dental fluorosis is caused by taking in too much fluoride over a long period when the teeth are forming under the gums. Only children aged 8 years and younger are at risk because this is when permanent teeth are developing; children older than 8 years, adolescents, and adults cannot develop dental fluorosis. The severity of the condition depends on the dose (how much), duration (how long), and timing (when consumed) of fluoride intake. A Cochrane review of 25 studies 9) showed there is weak unreliable evidence that starting the use of fluoride toothpaste in children under 12 months of age may be associated with an increased risk of fluorosis. The evidence for its use between the age of 12 and 24 months is indeterminate. If the risk of fluorosis is of concern, the fluoride level of toothpaste for young children (under 6 years of age) is recommended to be lower than 1000 parts per million (ppm) 10). Overall, the results of the studies reviewed suggest that, where the fluoride level in water is 0.7 ppm, there is a chance of around 12% of people having dental fluorosis that may cause concern about how their teeth look 11). Increases in the occurrence of mostly mild dental fluorosis were recognized as more sources of fluoride became available to prevent tooth decay. These sources include drinking water with fluoride, fluoride toothpaste—especially if swallowed by young children—and dietary prescription supplements in tablets or drops (particularly if prescribed to children already drinking fluoridated water). Very mild and mild forms of dental fluorosis—teeth have scattered white flecks, occasional white spots, frosty edges, or fine, lacy chalk-like lines. These changes are barely noticeable and difficult to see except by a dental health care professional. Moderate and severe forms of dental fluorosis—teeth have larger white spots and, in the rare, severe form, rough, pitted surfaces. What can parents and caregivers do to reduce the occurrence of dental fluorosis ? You should know the fluoride concentration in your primary source of drinking water, especially if you have young children. This information should help with decisions about using other fluoride products, particularly fluoride tablets or drops that your physician or dentist may prescribe for your young child. Fluoride tablets or drops should not be used at all if your drinking water has the recommended fluoride concentration of 0.7 mg/L or higher. Use an alternative source of water for children aged 8 years and younger if your primary drinking water contains greater than 2 mg/L of fluoride.In some regions of the United States, public water systems and private wells contain a natural fluoride concentration of more than 2 mg/L; at this concentration, children 8 years and younger have a greater chance for developing dental fluorosis, including the moderate and severe forms. These children should have an alternative source of drinking water that contains fluoride at the recommended level. For very young children, less than 2 years old: Do not use fluoride toothpaste unless advised to do so by your doctor or dentist. You should clean your child’s teeth as soon as the first tooth appears by brushing without toothpaste with a small, soft-bristled toothbrush and plain water. For children aged 2 to 6 years: Apply no more than a pea-sized amount of fluoride toothpaste to the brush and supervise their tooth brushing, encouraging the child to spit out the toothpaste rather than swallow it. Until about age 6, children have poor control of their swallowing reflex and frequently swallow most of the toothpaste placed on their brush. A possible relationship between fluoridated water and cancer risk has been debated for years. The debate resurfaced in 1990 when a study by the National Toxicology Program, part of the National Institute of Environmental Health Sciences, showed an increased number of osteosarcomas (bone tumors) in male rats given water high in fluoride for 2 years 12). However, other studies in humans and in animals have not shown an association between fluoridated water and cancer 13), 14), 15). In a February 1991 Public Health Service report, the agency said it found no evidence of an association between fluoride and cancer in humans. The report, based on a review of more than 50 human epidemiological (population) studies produced over the past 40 years, concluded that optimal fluoridation of drinking water “does not pose a detectable cancer risk to humans” as evidenced by extensive human epidemiological data reported to date 16). In one of the studies reviewed for the Public Health Service report, scientists evaluated the relationship between the fluoridation of drinking water and the number of deaths due to cancer in the United States during a 36-year period and the relationship between water fluoridation and number of new cases of cancer during a 15-year period. After examining more than 2.2 million cancer death records and 125,000 cancer case records in counties using fluoridated water, the researchers found no indication of increased cancer risk associated with fluoridated drinking water 17). In 1993, the Subcommittee on Health Effects of Ingested Fluoride of the National Research Council, part of the National Academy of Sciences, conducted an extensive literature review concerning the association between fluoridated drinking water and increased cancer risk. The review included data from more than 50 human epidemiological studies and six animal studies. The Subcommittee concluded that none of the data demonstrated an association between fluoridated drinking water and cancer 18). A 1999 report by the CDC supported these findings. The CDC report concluded that studies to date have produced “no credible evidence of an association between fluoridated drinking water and an increased risk for cancer” 19). Subsequent interview studies of patients with osteosarcoma and their parents produced conflicting results, but with none showing clear evidence of a causal relationship between fluoride intake and risk of this tumor. In 2011, researchers examined the possible relationship between fluoride exposure and osteosarcoma in a new way: they measured fluoride concentration in samples of normal bone that were adjacent to a person’s tumor. Because fluoride naturally accumulates in bone, this method provides a more accurate measure of cumulative fluoride exposure than relying on the memory of study participants or municipal water treatment records. The analysis showed no difference in bone fluoride levels between people with osteosarcoma and people in a control group who had other malignant bone tumors 20). More recent population-based studies using cancer registry data found no evidence of an association between fluoride in drinking water and the risk of osteosarcoma or Ewing sarcoma 21), 22). Where can you find additional information on fluoridated water ? The CDC has information at 23) on standards for and surveillance of current fluoridated water supplies in the United States. The Environmental Protection Agency has more information about drinking water and health at 24). The information on this page includes details about drinking water quality and safety standards. A recent report from the National Research Council 2006 26) concluded that adverse effects of high fluoride concentrations in drinking water may be of concern and that additional research is warranted. Fluoride may cause neurotoxicity in laboratory rats, including effects on learning and memory 27), 28). A recent experimental study where the rat hippocampal neurons were incubated with various concentrations (20 mg/L, 40 mg/L, and 80 mg/L) of sodium fluoride in vitro showed that fluoride neurotoxicity may target hippocampal neurons 29). Although acute fluoride poisoning may be neurotoxic to adults, most of the epidemiological information available on associations with children’s neurodevelopment is from China, where fluoride generally occurs in drinking water as a natural contaminant, and the concentration depends on local geological conditions. In many rural communities in China, populations with high exposure to fluoride in local drinking-water sources may reside in close proximity to populations without high exposure 30). A systematic review and meta-analysis of published studies 31) to investigate the effects of increased fluoride exposure and delayed neurobehavioral development in children, age from four to 16 years. All but two of the included studies were conducted in China, this is because many studies on fluoride neurotoxicity have been published in Chinese journals only. In total, the review authors identified 27 eligible epidemiological studies with high and reference exposures, end points of IQ scores, or related cognitive function measures with means and variances for the two exposure groups. Fluoride exposure was mostly through drinking water, but three studies assessed exposure due to coal burning. The exposed groups had access to drinking water with fluoride concentrations up to 11.5 mg/L 32); thus, in many cases concentrations were above the levels recommended (0.7–1.2 mg/L; The U.S. Department of Health and Human Services (HHS)) or allowed in public drinking water (4.0 mg/L; U.S. EPA) in the United States (U.S. EPA 2011 33)). A recent cross-sectional study based on individual-level measure of exposures suggested that low levels of water fluoride (range, 0.24–2.84 mg/L) had significant negative associations with children’s intelligence 34). Results: Findings from the meta-analyses of 27 studies published over 22 years 35) suggest an inverse association between high fluoride exposure and children’s intelligence. Children who lived in areas with high fluoride exposure had lower IQ scores than those who lived in low-exposure or control areas. The findings are consistent with an earlier review 36). The results suggest that fluoride may be a developmental neurotoxicant that affects brain development at exposures much below those that can cause toxicity in adults 37). For neurotoxicants such as lead and methylmercury, adverse effects are associated with blood concentrations as low as 10 nmol/L. Serum fluoride concentrations associated with high intakes from drinking water may exceed 1 mg/L, or 50 µmol/L—more than 1,000 times the levels of some other neurotoxicants that cause neurodevelopmental damage. Supporting the plausibility of our findings, rats exposed to 1 ppm (50 µmol/L) of water fluoride for 1 year showed morphological alterations in the brain and increased levels of aluminum in brain tissue compared with controls 38). Conclusions: The results support the possibility of an adverse effect of high fluoride exposure on children’s neurodevelopment. Future research should formally evaluate dose–response relations based on individual-level measures of exposure over time, including more precise prenatal exposure assessment and more extensive standardized measures of neurobehavioral performance, in addition to improving assessment and control of potential confounders. 3, 4, 6. ↵ Centers for Disease Control and Prevention. Public Health Service report on fluoride benefits and risks. JAMA 1991; 266(8):1061–1067. 5, 19. ↵ Centers for Disease Control and Prevention. Achievements in public health, 1900–1999: fluoridation of drinking water to prevent dental caries. Morbidity and Mortality Weekly Report 1999; 48(41):933–940. 7. ↵ Centers for Disease Control and Prevention (August 2010). 2008 Water Fluoridation Statistics. Retrieved August 10, 2011. 14, 17, 18. ↵ National Research Council, Subcommittee on Health Effects of Ingested Fluoride. Carcinogenicity of fluoride. In: Health Effects of Ingested Fluoride. Washington, DC: National Academy Press, 1993. 26, 30. ↵ NRC (National Research Council). 2006. Fluoride in Drinking Water: A Scientific Review of EPA’s Standards. Washington. 29. ↵ Zhang M, Wang A, Xia T, He P. 2008. Effects of fluoride on DNA damage, S-phase cell-cycle arrest and the expression of NF-κB in primary cultured rat hippocampal neurons. Toxicol Lett 179:1–5. 32. ↵ Wang SX, Wang ZH, Cheng XT, Li J, Sang ZP, Zhang XD, et al. 2007. Arsenic and fluoride exposure in drinking water: children’s IQ and growth in Shanyin County, Shanxi Province, China. Environ Health Perspect 115:643–647. 33. ↵ U.S. EPA. 2011. EPA and HHS Announce New Scientific Assessments and Actions on Fluoride: Agencies Working Together to Maintain Benefits of Preventing Tooth Decay while Preventing Excessive Exposure. 34. ↵ Ding Y, Gao Y, Sun H, Han H, Wang W, Ji X, et al. 2011. The relationships between low levels of urine fluoride on children’s intelligence, dental fluorosis in endemic fluorosis area in Hulunbuir, Inner Mongolia, China. J Hazard Mater 186:1942–1946. 36. ↵ Tang QQ, Du J, Ma HH, Jiang SJ, Zhou XJ. 2008. Fluoride and children’s intelligence: a meta-analysis. Bio Trace Elem Res 126:115–120. 37. ↵ Grandjean P. 1982. Occupational fluorosis through 50 years: clinical and epidemiological experiences. Am J Ind Med 3(2):227–336. 38. ↵ Varner JA, Jensen KF, Horvath W, Isaacson RL. 1998. Chronic administration of aluminum-fluoride or sodium-fluoride to rats in drinking water: alterations in neuronal and cerebrovascular integrity. Brain Res 784:284–298.